Linda Fedigan’s contributions to gender and primatology are discussed in relation to two books that, from a science studies perspective, were key turning points in this aspect of primatology’s history. One is Donna Haraway’s (1989) Primate Visions, and the other is Shirley Strum and Linda Fedigan’s (2000) Primate Encounters. Fedigan’s publications about gender and primatology span years before, during and after these important intellectual syntheses and call to action. Her work is considered here as an object of study by science studies practitioners, for the unique insights she provided to this field, and as a toolkit for testing possible real outcomes of current gender imbalances in primatology and other sciences. I wish to thank the organizers for the privilege and pleasure of the opportunity to reflect on Linda Fedigan’s work at the Festschrift conference in the magnificent surroundings of the Banff Centre. Many hands are involved in the organization of a conference, but special thanks to Jeremy Hogan and the editors of the Festschrift. Thanks to Mary Pavelka for getting this particular ball rolling on singling out Linda’s contributions to gender and primatology. Thanks to two reviewers of the paper for helpful comments. 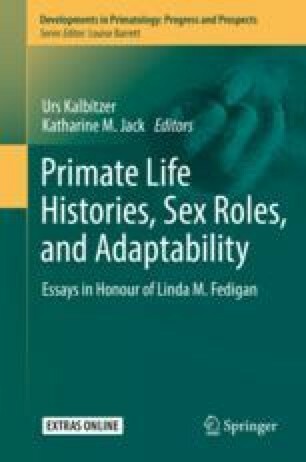 Thanks to Linda Fedigan for responding to questions so rapidly and with good humour as I sought the background to her thoughts on gender and primatology. I thank her too for being such a fine scholar, teacher, colleague and friend over many years.